A developing storm system will bring widespread heavy snow to the Midwest Friday into Saturday ahead of the coldest air of the season. The heaviest of snow looks to fall south of I-90 and north of I-80 on Friday. Models did come together in recent runs, HOWEVER, the european model has trended south in the last few hours. It is one of the more reliable models and could be on to something. With that said, the map to your left puts weight on prior runs as well as recent ones, a blend of models. 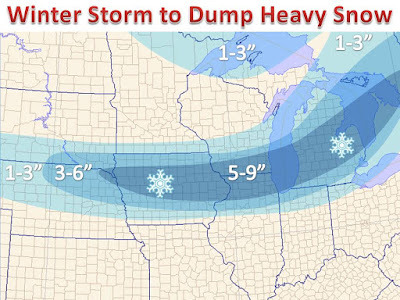 For many areas across parts of Northern Iowa and Southern Wisconsin, this will has the potential to be the heaviest snow since the 2013-2014 season, depending exactly where the heavy band sets up! Winter storm watches have already been issued for the northern half of Iowa east through the WI/IL border. Most of these will kick over to winter storm warnings by the late afternoon or Friday morning time period. Otherwise, winter weather advisories will be issue just outside the band of heavier snow. 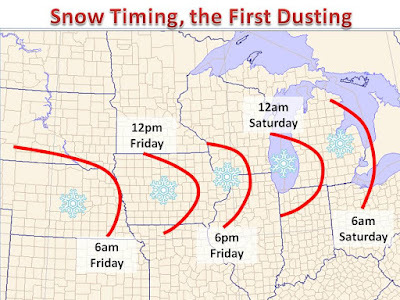 The timing of the snow has a larger role than usual. With it being so warm in recent weeks, and months for that matter, ground temperatures are rather high. A large portion of the snow will come at night which only amplifies the efficiency of snow accumulation on the surface. It will take a bit to accumulate on pavement, but the temperature and snow rate should overcome the warmer pavement temperatures relatively quickly. Regarding timing, the storm looks to really ramp up by Friday afternoon. After about 12:00, a band of heavier snow will begin to train over central Iowa through Southern Wisconsin and Lower Michigan. Most of the snow will fall Friday evening into Saturday morning across these areas. 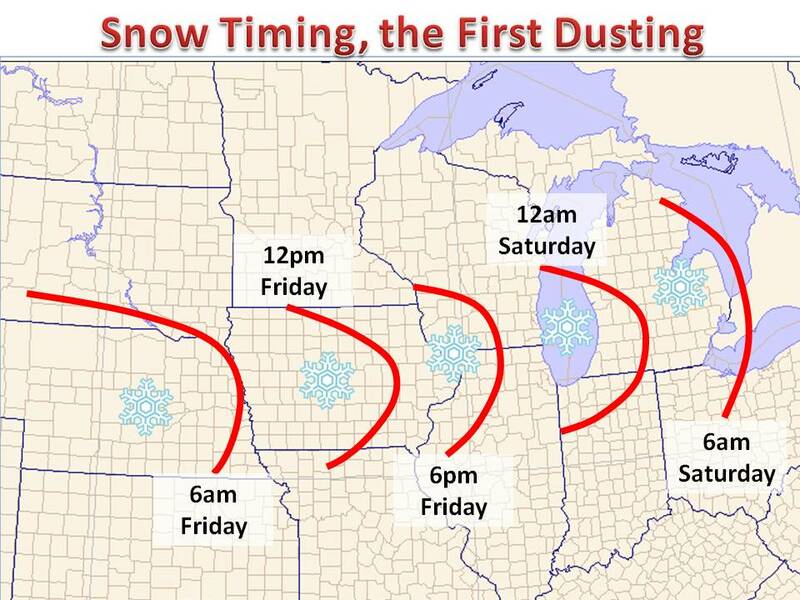 This sets up a couple snowy college football games, such as the Northwestern @ Wisconsin games on Saturday. Otherwise, the map should give a general idea when the snow will begin to coast grassy surfaces! Behind the system winds kick up out of the northwest and usher in cold air from Canada, here is a look at low temperatures for your Sunday. Very cold!...especially with fresh snow cover, off the 12z GFS model. 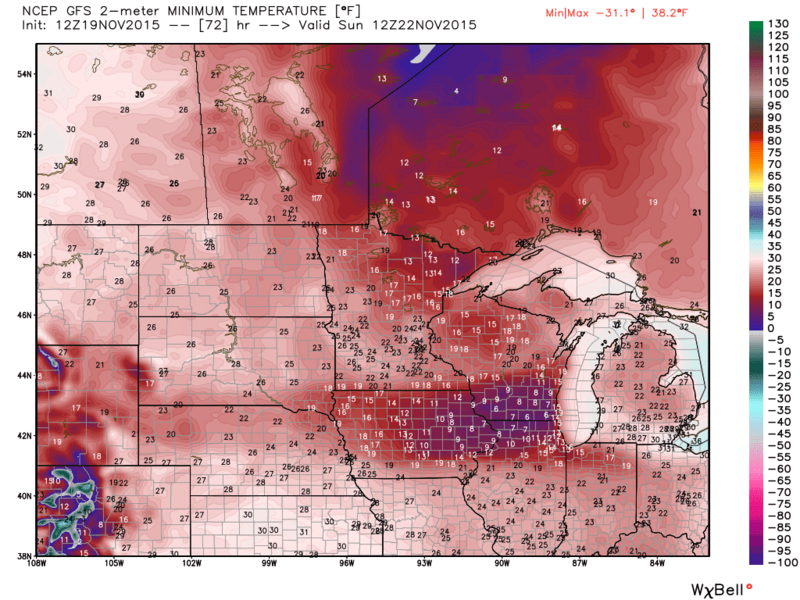 It could be short lived however, as a surge of warm air is possible around Turkey Day! Maybe 15-25 degrees above average!